With hundreds of shows to her credit, Christine Dunstan is a doyen of Australian theatre. Her productions continue to grace stages across Australia with many touring internationally. One of her current shows stars Toni Lamond in “Times of My Life” - a new play-with-music by Lamond and Tony Sheldon and billed as a candid yet humorous take on the history of Australian show biz. This forward planning is evidence that Christine refuses to rest on her laurels. She featured in two major awards in 2007 – The Drover Award for outstanding performance by an individual or company and The Helpmann Award for best regional touring production - won with the Ensemble Theatre for their Six Dance Lessons in Six Weeks. 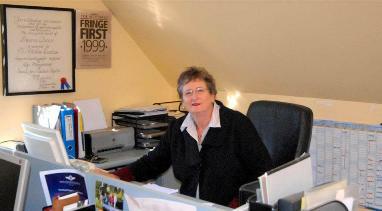 Head office for Christine Dunstan Productions is a mountaintop retreat in the Shoalhaven at Berry. There national and international stage production operations are melded with farming activities. 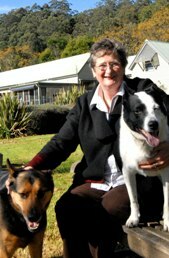 Production company accountant Cherrie McDonald is the force behind the farming operations as well as a range of other theatre and outside activities. Christine is from the city. Cherrie grew up on her family’s farm at Quirindi. When Christine decided to quit city life and move her production headquarters, it was Cherrie who actually located the Berry property. And it helped that their long-time associates, actors Garry McDonald and Diane Craig, would be in their neighbourhood on the historic Shoalhaven township’s Woodhill Mountain. ‘’The landscape knocks us out…it’s such beautiful country……close to Sydney which is easily reachable, I go there once a week….here we have the best of both worlds,’’ Christine explains, as her horse meanders up the hillside to nuzzle her hand over the fence of the house paddock. The property was a lifestyle choice. Christine and Cherrie now grow their own vegetables, run cattle, plant trees. They’re time poor but sitting on an farming asset and making it work. In fact, the hours they had been spending as city-dwelling commuters have been converted to farming time. Now they do business on the phone from the car during commuting trips to Sydney. While Christine has spent her entire career in the theatre, Cherrie first trained as a physical education teacher, converted to accountancy with CPA experience, then took a degree in environmental management at Macquarie University. Just as they’ve done by moving what traditionally has been city-centric theatre production to the country, they have a propensity to keep pushing the boundaries with their other business activities. They’ve run the national service organization Australian Performing Arts Centres Association (125 art centres are members) from Berry. They’ve delivered national conferences allied with the performing arts in Canberra, Melbourne, Sydney, Brisbane and Launceston from Berry - as well as a variety of other activities in their role as events managers. And then there are their nationally and internationally acclaimed theatre contacts of 40 years standing, Garry and Diane and their family, living just around the corner. When Christine and Cherrie first began looking to move from the city they focused their search north, principally around the Hunter Valley. They’d holidayed at Jervis Bay, were knocked out by the beauty of the area but the South Coast had not featured in their SeaChange planning until Cherrie saw an advertisement for the Woodhill Mountain property. ‘’The landscape and aspect here sold us,’’ Christine said. Services and technology to support their lifestyle and their business operations were on hand. Christine Dunstan Productions’ Sydney offices ran 11 phone lines – at Berry they have six on two independent systems that allow separation of theatre from farming and home operations. They have ADSL access which allows Christine to send large files of artwork from her desk to clients and theatres across Australia and overseas. She “did poorly” academically at school - but there was a reason. Christine is moderately deaf but her deafness was not diagnosed until she was 14 and hearing aids were not considered an option in those days. During her last year at high school a perceptive teacher, attempting to encourage Christine’s excellent communication skills, helped her start a school drama club. Through that drama club Christine discovered theatre – and that changed her life. She left the security of home at the age of 16 and “walked straight into a $15 a week job” as an assistant stage manager. The going was tough. Christine paid $12 a week rent for a flat, lived on the residual $3 but relished her work – “sweeping the stage and washing the costumes” at the Independent Theatre, North Sydney, under the direction of the legendary Doris Fitton. After the Independent, Christine went to Canberra Repertory Society, then Melbourne Theatre Company. She has worked with every major theatre company in Australia, and even run the Araluen Arts Centre Centre in Alice Springs ….. and she worked with Barry Humphries. Only a close study of her CV provides a proper perspective on Christine’s career trajectory. After 30 years in the theatre industry, with a strong network of contacts and with very strong opinions on how to produce shows, Christine decided it was ‘’time to put my money where my mouth is’’ and go out on her own. Ever since she has allowed market forces to sit in judgment on her theatrical business acumen. Her mission is to create and produce primarily Australian works. She’s produced ‘’hundreds of them’’ always with Australian artists with many of her productions going international. Many have featured just a single artist. Some have made money, others not. “The 3 Divas” production toured in 2000 and again in 2002 and, says Christine, the time it now ripe for a third tour, the theatre-going public having been given enough “breathing space.” Artists need to keep reinventing themselves and move with public taste, she says. Among the hundreds of shows she has produced, Christine has her favourites – chosen for a variety of reasons. She ranks “Lyrebird: Tales of Helpmann” among her best. This one-man show is the work of Canadian actor Taylor Coppin, who grew up after Sir Robert Helpmann’s heyday, but as a result of detailed research wrote a piece on Helpmann from a perspective different to that of an Australian. This show started life in 1996 at the Adelaide Festival, then went to Edinburgh, London and New Zealand. She “gave TV fans the opportunity to experience theatre’’ by bringing three stars from the British TV series “The Bill” into Australia for her “Lone Star” production which drew huge audiences – among the patrons many who had never before experienced live theatre. This show tapped into the desire of actors to go back to the theatre where they could experience the immediacy of the stage and connect with their audiences. For those in the audiences there was a unique opportunity to interact with the stars. Back on stage after their performances and with the house lights up, “The Bill” personalities had dialogue with patrons who felt they “knew them” because they’d previously seen them twice a week - but only as images televised into their living rooms. Currently Christine is producing “Lotte’s Gift,” written by David Williamson for Karin Schaupp, the internationally acclaimed classical guitarist and a talented actor. It came about over a cup of tea when Karin told Williamson her grandmother’s story. Deeply moved by what he’d heard, Williamson wrote the play and invited Christine to produce it. And Australian theatre critics agree. “Lotte’s Gift” is Christine’s major piece destined for Edinburgh next year and then a season in England - a one-woman show that will have a life in repertory theatre for a number of years in venues around the world. While her work draws audiences across the globe and her network of contacts is worldwide Berry will remain the epicenter of Christine’s operations. Her 92-year-old mother lives in Sydney and Christine visits her every week. She also makes a point of meeting business associates face to face as often as possible and regularly travels interstate. And Christine has embraced technology. She no longer makes those 3am calls to the United Kingdom – she emails and there’s a reply when she goes to her attic office next morning. She video-conferences. She attends meetings in Sydney (in by 10, out by four) and theatres in Sydney, Wollongong and interstate. She has a ‘’streamer’’ system that delivers voice conversation from her mobile phone to her hearing aids, she has voice recognition dialing – all allowing her to use the two-hour drive to Sydney airport very productively. ‘’My links with the world haven’t changed,’’ Christine said. Actually her systems have been refined by technology. She no longer needs a secretary in her office. She no longer travels with a fax machine in her luggage. These days she simply totes her computer. “Our SeaChange was made possible by technology,’’ she said. Cherrie’s SeaChange has not disrupted her CPA work – on behalf of the theatre production company as well as the Australian Performing Arts Centres Association and outside clients such as the Bundanon Trust. And her environmental and farming activities are flourishing. Because of their high elevation Christine and Cherrie are on the alert for approaching storms. Well before the first lightning strike in their area can pose a threat to their electricity supply, they disconnect every computer around the place. And if their electricity does go off, their water supply also goes off. That’s the price they have to pay for living on Woodhill Mountain.